The Greek parliament approved a package of tough reforms demanded by the country's creditors in return for a bailout. The vote early Thursday was 229-64. The ruling Syriza party was able to pass the bill with support from pro-European opposition parties. Prominant Syriza party members were among the 38 who voted against the package, including Energy Minister Panagiotis Lafazanis and former Finance Minister Yanis Varoufakis. Prime Minister Alexis Tsipras told lawmakers shortly before the vote that he had no choice but to accept the demanding terms of Greece's creditors. "We don't believe in it, but we are forced to adopt it," he said. In order for Greece to secure bailout funds, the agreement must now go before the parliaments of some of the 19 other members of the eurozone. Germany is set to vote on Friday. On Wednesday, Greek anti-austerity demonstrators threw Molotov cocktails at police in front of the country's parliament building, just as lawmakers began debate on the austerity demands. Police responded with tear gas, sending the protesters scurrying into Syntagma Square. The violence marred otherwise peaceful protests as thousands marched through Athens to demonstrate against the austerity measures. Greek pharmacists pulled down the shutters on their stores to protest proposed reforms, while civil servants walked off their jobs. But one survey of Greeks showed 70 percent support for the bailout plan. The International Monetary Fund warned that Athens' debt is "highly unsustainable." The IMF predicted that Greece's fortunes would worsen in the next two years, with its debt reaching close to twice that of its national economic product. It said the Greek debt, now tens of billions of dollars, could "only be made sustainable through debt relief measures that go far beyond what Europe has been willing to consider so far." 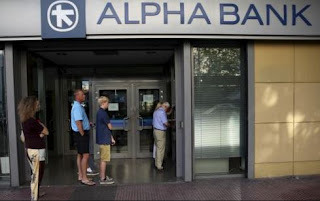 ​For two weeks, Greek banks have been shut, with increasingly desperate depositors limited to daily withdrawals of 60 euros ($67) from cash machines. "If something unexpected comes up," Athens resident Kyriakoula Papakostantinou said, "there is no more money to pay for anything extra. We will make do for now. But if something unexpected comes up, we don't know how we will handle it. There is a sense of insecurity." The austerity plan specifies new taxes, pension reforms and tighter supervision of government finances. European creditors have demanded parliamentary approval as a starting point for negotiations on the new bailout, which would be Greece's third in five years. Spanish Prime Minister Mariano Rajoy said Wednesday that he would submit the bailout plan to the Spanish parliament, to ensure support among Spaniards for the funds they will be obligated to contribute to the Athens loan. He did not say when a vote would take place.